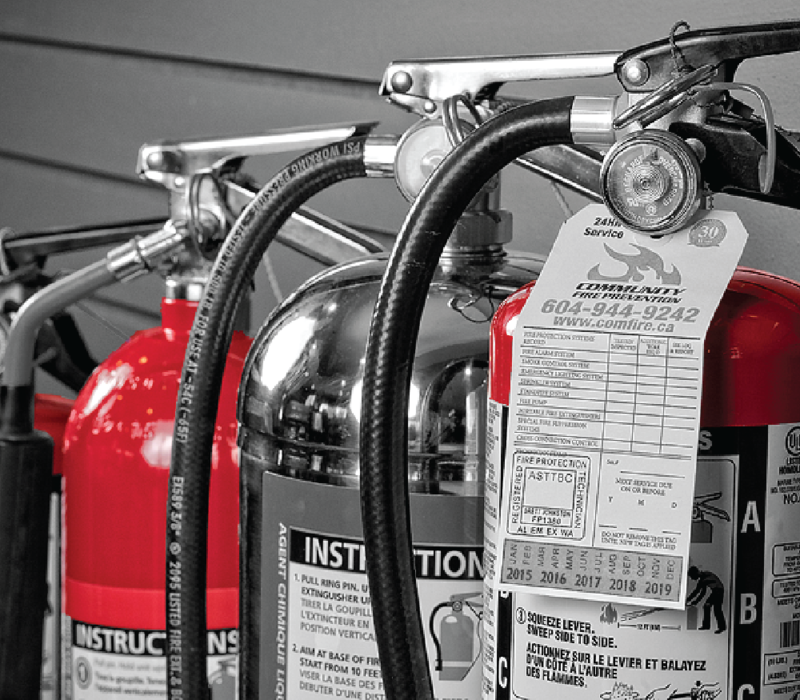 Certified Extinguisher Inspections: Fire Extinguisher Service Vancouver - Commercial Fire Extinguisher Inspection Surrey | ComFire Ltd.
Fire Extinguishers are often the first line of defense in many fire emergencies. Fully understanding a portable fire extinguisher’s capabilities and limitations are often overlooked. Fire Extinguishers shall be inspected at intervals not greater than 30 days as outlined within NFPA 10. This includes confirming location, operating nameplates are intact, safety seals are in place, and examination for obvious physical damage, corrosion, leakage and clogged nozzles. Internal Examinations of portable fire extinguishers vary from 1-6 years depending on extinguisher type. Hydrostatic Testing of fire extinguisher cylinders varies from 5 to 12 years dependent upon extinguisher type . Stay compliant. As outlined in Section 6.2 of the BC Fire Code, portable and wheeled fire extinguishers are required to be maintained in accordance with NFPA 10. This standard calls for the inspection of portable fire extinguishers at a minimum of 30 days and a maintenance interval of not more than 1 year. Let the trained and knowledgeable Community Fire Prevention staff help you meet all requirements of both your local Authority Having Jurisdiction (AHJ) as well as outside insurance agencies. Know the Code. Community Fire Technicians are trained and certified by ASTTBC and stay up to date with ongoing in-house training of codes, standards and manufacturers requirements. Fire Extinguishers also require on-going multiyear inspections where the cylinders are hydrostatically tested to ensure safety. Keep your fire extinguishers in peak operation. By completing monthly inspections of site fire extinguishers you are increasing the assurance that the fire extinguisher remains fully functional over the course of a year. If you require Fire Extinguisher Service or training anywhere throughout the Greater Vancouver area, we encourage you to get in touch with our professional technicians today. Visit our fire protection office in Port Coquitlam, BC, or give us a call at 604-944-9242, to learn more about our fire extinguisher services and how we can help your organization! Q: Is there a singly style fire extinguisher that will work on all fires? Class B Fire – Flammable and combustible liquids such as petroleum greases, tars, oils, solvents, etc. Q: Is it cheaper to just purchase a new fire extinguisher? A: Barring any extensive repairs or damaged parts, Community Fire always recommends that a Fire Extinguisher be serviced as long as it’s cylinder life . Pricing generally works out to half the cost of a new extinguisher with most common portable fire extinguisher with Community Fire’s pricing structure. Q: At what point can I no longer service my dry chemical fire extinguisher? A: NFPA 10 indicates that Dry Chemical stored pressure fire extinguishers manufactured prior to October 1984 shall be removed from service at the next 6 year maintenance or hydrostatic test, which ever comes first. Q: What type of Fire Extinguisher should I have? Are there additional Hazards in the surrounding area? Is there energized electrical equipment in the vicinity?